The Helldiver took to the air for the first time on December 9th, 1935. It was originally designed to be powered by the Wright Cyclone engine and was designated the XSBC-2. The Helldiver was refitted with the more powerful Pratt & Whitney R-1535 and its designation was changed to the SBC-3. The Navy took deliveries of the new aircraft in mid 1937 with the first batch of carrier based aircraft going to the USS Yorktown. Time and technology caught up to the advanced bi-plane. It was relegated to hack duties and as advanced trainers for units in Florida. The last aircraft was stricken off the Navy roster in October of 1944. The significance of the Helldiver was its contributions in developing dive bombing tactics and aircrew skills crucial to winning the war in the Pacific. The box is small but the kit and all the extras are a perfect fit. It is a sturdy box that protects the kit well and fits on your "Planes To Do" shelf with room to spare. I really like the box art that Classic Airframes is using. All plastic, photoetched, and resin parts are bagged. 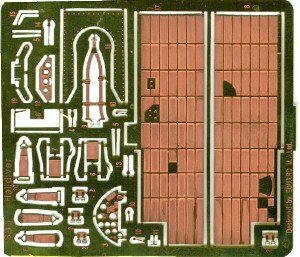 The engine cylinders, crankcase and drop tank are in one bag and the cockpit floor, bulkheads and other sundry parts are in another bag. The photoetched parts are packaged with a cardboard backing to keep them from bending. 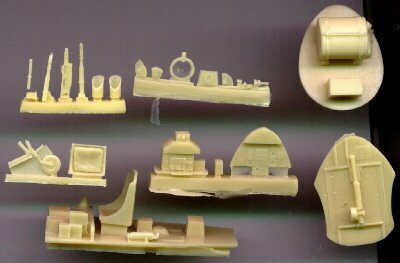 A small acetate instrument panel is included in the same bag as the photoetched parts. 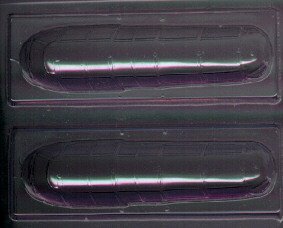 There are two vacuum-formed canopies on one piece of clear plastic placed loose in the box. The instructions are done on clean white paper and sharp black printing is used. There is some verbiage on the top of the first page discussing that the kit is for experience modelers and due to the nature of limited run kits, require additional time. I found it unusual that they strongly recommend that the builder get the Squadron "SBC Helldiver In Action" book by name to use as a reference. But I do second this recommendation. It is rare that a model company refers you directly to a product unless it is made by them, like Tamiya and their line of paints and accessories. The instructions for different areas that need painting are vague at best. A triangle A is white, A triangle E is Olive Drab and so on. Basic universal signs are used on where to drill or bend the photoetched parts. I like the exploded views on the assembly stages. They are clear and easy to understand. The front side of the instruction sheet has an individual parts breakdown with an associated part number next to the part. This is good for a pre-assembly inventory of all those little resin parts. There is a second sheet of paper that has a painting and markings guide. It has federal stock numbers for the paint and shows you the two choices you have. 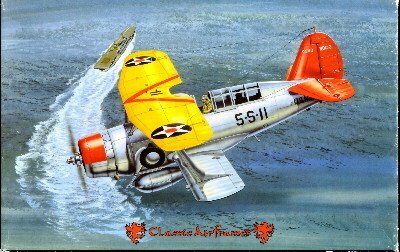 A red-tailed, red-cowl, yellow wing SBC-3 of the VS-5 Squadron based in California, June 1939 and a White-tailed, blue cowl, yellow wing Helldiver from VS-3 Squadron. Decals for the later two tone blue/gray paint are also included. The other side of the card has a brief history and some technical data to round out the information part of the kit. The decals are custom made by Microscale and are up to their usual high quality. You can have the National Star with or without the red center by adding a small decal to the center of the star. They are in register and look opaque without being too thick. Time will tell how these decals work out. I have had good luck with Microscale lately and I hope these decals are not any different than their normal line. I’m not real impressed with the vacuum formed canopy set. There are two canopies on a small clear sheet. The clear plastic is thick and there is a lot of pit marks in it. This seams like a great area to replace with a set of Krystal Klear canopies from Squadron, if they ever get around to making a set. Because of the thick clear stock used the canopy frames are not real crisp. Use some left over True Details canopy railing and you can make a very nice canopy. There are a lot of scratches and pit marks made by dust and debris in the molding area. Classic Airframes should have checked their quality control and cleanliness in this area. I am glad that they give you two. I have been saved many times by this practice and am quite happy that it seems to have become the standard for manufactures and aftermarket companies. I wish the model kit manufacturers would follow suit. I like the Photoetched fret a lot. There are very delicate seatbelts and instrument panels along with the side panels of the cockpit. They are separately bagged and on a cardboard backing sheet. 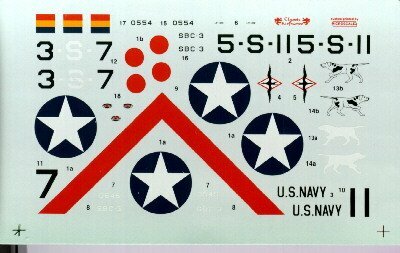 There is a small acetate instrument panel that all you have to do is paint the back white and place onto the instrument panel. They seem of the highest quality and very well done. Here Classic Airframes really shined. Edward was the subcontractor for this excellent set that explains a lot! The first bag of resin parts contains the engine crankcase, three rows of cylinder heads and the drop tank. These are very well done with almost no flash or casting lines. The cylinder heads are of first rate quality with very delicate cooling fins scribed into each head. The spark plug wire is molded into the top of the cylinder already. For you super detail nuts, a small file will knock this down and you can string your own set. I don’t think you can see them under the cowl anyway. The second bag contains the forward bulkhead with the oil tank. Another instrument panel with a radio panel, a seat/floorboard combo, and other antennas, tail wheel, seat cushion, wheel well bulkhead and joystick. There is just a little flash here but by no means out of the ordinary for resin parts. The detail is very crisp and clean. I am not too sure on the fit of these components but I haven’t built a mixed media kit that a little sanding and fitting were not required. The kit itself comes on two trees with the bottom wing being of one piece and thrown loose in the bag. All plastic is done in a medium gray color. 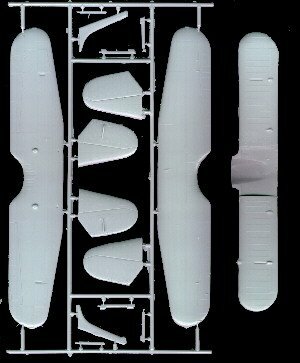 On the SBC-4 that Classic Airframes makes, all the components are the same except the fuselage halves are replaced with the appropriately shaped ones for that particular model of Helldiver. The panel lines and detail are extremely light. If you are not careful, a coat of primer and Future Floor Polish will make all the detail disappear. It is always a delicate balancing act not to make the detail to exaggerate, but to give enough to appear right to the viewer. I don’t understand why Classic Airframes did not make a set of resin wheels but decided to include two lumps that could only pass for wheels. They seem soft in their detail and come in half pieces that have to be glued together. A trip to the spare parts dungeon is in order here. I hope True Details is still listening. The landing gear struts also seem soft in the detail range. I hope they look better when cleaned up and painted. 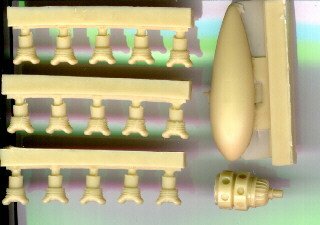 You might even think about scratch building them out of brass tube or plastic stock using the originals as patterns. There is a gun camera that is an optional mount on the top of the wing. The front cowling comes in two pieces and has the same fine detail that the fuselage halves had. I think the prop suffers from the same soft mold look. The back sides of the props are flat and need a little shaping to look right. The tailhook looks like a straight rod with a little curve in it. I think I could scratchbuild one better. On to the second tree. The wing halves have no alignment pins in them. I like this better because it allows you to get the exact alignment you want on the wings. There are deep injection stubs on the inside of the elevator halves. They will have to be ground down before the upper and lower halves of the elevator can be glued down. Why Classic Airframes made the elevators in two piece upper and lower sections but made the lower wing one piece will have to be filed under the same folder as the split wheels. The lower wing has some deep grooves in the leading edge and suffers from the soft detail of the other parts in the kit. The wing struts are also molded on this tree. They look to scale and are acceptable. This preview sounds a bit negative in its content but I couldn’t be happier with this kit. Limited run kits often have these types of faults due to the limited time spent on refinement. It is hard to make a perfect kit right from the start without the resources that say Tamiya or Hasagawa have. Accurate Miniatures gave the super big boys a run for their money. I think Classic Airframes are on the right track, tackling off beat kits like the P-51H even though it has its own faults and the I-153 Chaika, P-12 and so on. Although the kit has its flaws, I can tell you that I will continue to buy from this company. The Helldiver has a lot of room for detailing and aftermarket stuff (when it hits the shelf). If it was all done for you, what would be the reason for modeling anything! I can’t wait to start building this kit. Plus, the early Helldiver is a fantastic addition to any collection especially all you "Golden Age of Aviation" buffs. Classic Airframes should continue to tackle off beat subjects and I for one will continue buying their entire line of kits. If you would like your product reviewed fairly and quickly by a site that averages over 3,000 visits a day, please contact me or see other details in the Note to Contributors.